Valencian paella is one of the most well-known recipes of Spanish cuisine. Its delicious flavors have turned it into an essential dish all year round. However, its fame has led to the creation of other recipes that deviate from its original quality. There is only one true Valencian paella, and any other variation is a capital sin. Don’t be fooled by just any rice: take note of what, for Valencians, makes a paella truly Valencian. It does not have as much chorizo either. If you do this, then it’s not truely Valencian. Don’t take a cat for a rabbit: the classic ingredients are very specific, and there is no room for variation. Since it is such a popular dish, it is normal that variations of it have been created. 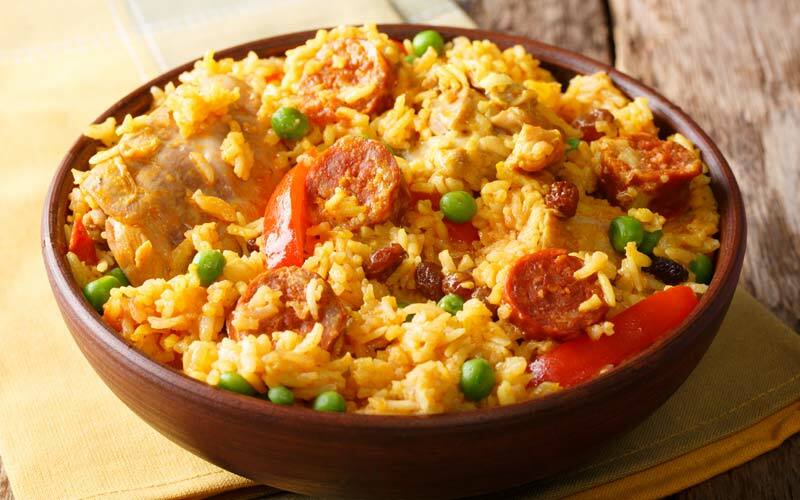 However, there is no more capital a sin than putting different ingredients (or different measurements of the right ingredients) in Valencian paella. For example: Valencian paella does not contain squid or prawns. For the Valencians, this would not be considered a seafood paella, but only rice with products from the sea. 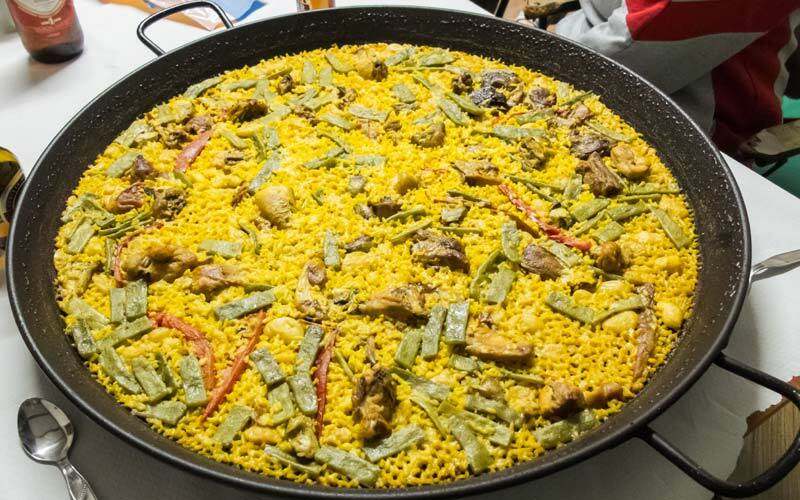 The ingredients of a paella that is 100% Valencian are the following: chicken, rabbit, garrofón (a type of bean), and plain green beans. As we said before, for Valencians, “rice with things” is not the same thing as paella. Authentic Valencian paella contains a clear list of ingredients, and there is a very precise way of cooking it. No one voluntarily imagines a tripe with prawns or a fabada with lentils. Why? Because this would be sacrilege; but we didn’t see it that way with Valencian paella. To make authentic Valencian paella, you can’t use just any kind of rice. You can’t use basmati, whole, or wild rice. This recipe should be prepared with round rice, a D.O. rice from Valencia. A Valencian can overlook the D.O. aspect of the rice used in paella, but they would never use anything but round rice. In addition, one should always cook the rice in water, not chicken or seafood broth. The Valencian paella boils in the broth that the paella itself ends up making. If you are thinking of cooking Valencian paella in a regular frying pan or in a pot, you’re headed in the wrong direction. Sure, you’re cooking rice, but you’re not cooking the famous Valencian dish. In addition, we often call the cooking container a “paellera,” but this is incorrect. Valencians know the cooking container simply as “the paella,” which is where the dish got its name. The thickness of the paella is another factor to consider. It should not exceed the width of your finger. So, if the paella is being prepared for four to six people, you’ll need a very big pan. This makes it difficult to prepare in a regular household. It’s true that this part of the recipe is one of the most controversial as well as one of the parts that is the easiest to mess up. If you measure it by hand, you could go overboard with the water or fall short, but the Valencians have come up with a way to avoid this. You should have approximately three parts water and one part rice in your paella recipe. You also have to pay attention to the heat at which you cook the dish. Valencian paella also must be made from dry rice. If you use Arroz Caldoso, it’s not paella.